In the Christian life, too, we should “match the hatch.” The commands “Rejoice with those who rejoice, weep with those who weep” (Rom. 12:15) and “Bear one another’s burdens” (Gal. 6:2) are exhortations to sympathy—to joining in others’ sufferings and blessings. These commands call us to look at our brothers and sisters and then reach for work gloves, put on sackcloth, or iron our finest party clothes. They call us to dress our hearts to match the people around us. 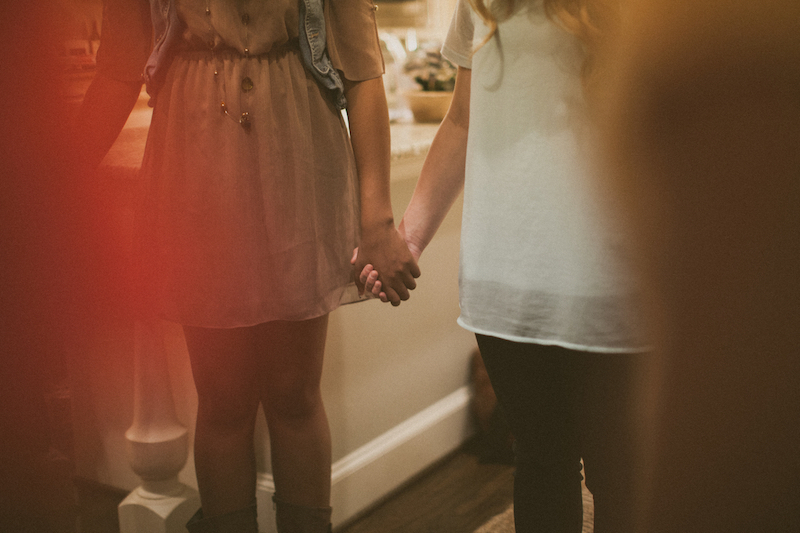 And one of the best ways we can match the hearts of others is by praying with them. Is your brother joyful? Give thanks alongside him. Is your sister grieving? Express sorrow with her. Does someone have a need? Make it your concern too. We do this most obviously when others are experiencing trials (or joys) we ourselves have experienced. When my husband and I suffered a miscarriage, other couples who’d also lost children prayed for us. Men and women sympathized with us at the church prayer meeting—asking God to tenderly care for us in our grief just as he had tenderly cared for them in theirs. And then a year later when we celebrated the birth of our son, the same couples rejoiced with us—praising God for his kind provision of a baby just as he had also given children to many of them. This is what Christ does for us. The God who became man always makes intercession for us (Heb. 7:25). The Savior who “has borne our griefs and carried our sorrows” (Isa. 53:4) sympathizes with us (Heb. 4:15). The Shepherd who celebrates with his friends when one sheep is restored (Luke 15:3–7) will rejoice with us as we pray. But we also sympathize with others in prayer when we notice they don’t have the blessings we do. We who are strong lend a hand to the weak—helping them to cast their burden on the Lord in prayer. In this way, the employed pray for the unemployed, the married for the widowed, the mature for the new believers, the healthy for the sick, and those at liberty for those in chains. [The prayer meeting] tends to keep alive the spirit of devotion; demonstrates, by the prayers of so many brethren who engage, the minor varieties, yet prevailing uniformity, of Christian experience; humbles the rich by the holy gifts and graces of the poor; encourages the poor by the sympathies, confessions, and acknowledgements of the rich; cheers the heart of the minister by the kind interest and fervent supplications of his flock; cements the minds of the members; and may be supposed to bring down the blessings of God upon the church. Has the Lord given your brother good health? Pray for it to continue. Has he given your sister a job that uses her gifts and provides for her financial needs? Pray she would have it for years to come. Has he blessed other church members with loving marriages, obedient children, opportunities for ministry, and abundant friendships? Pray for those blessings to be multiplied even further. This is self-denying love. Brothers and sisters, let us love one another by prayer. Editors’ note: Megan Hill is the author of Praying Together: The Priority and Privilege of Prayer in Our Homes, Communities, and Churches (Crossway, 2016). She will be leading “Walking with Others in Prayer” at the 2017 Bethlehem Conference for Pastors and Church Leaders, January 30 to February 1.